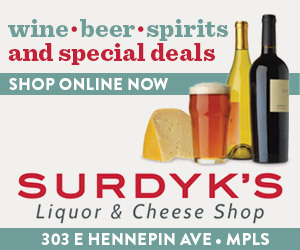 No one has ever accused the Bittercube group of being too straight-laced, and their newest project is appropriately off-the-wall—a collection of intense liqueurs in surprising flavors, but ones that are easy to mix and a delight to drink. 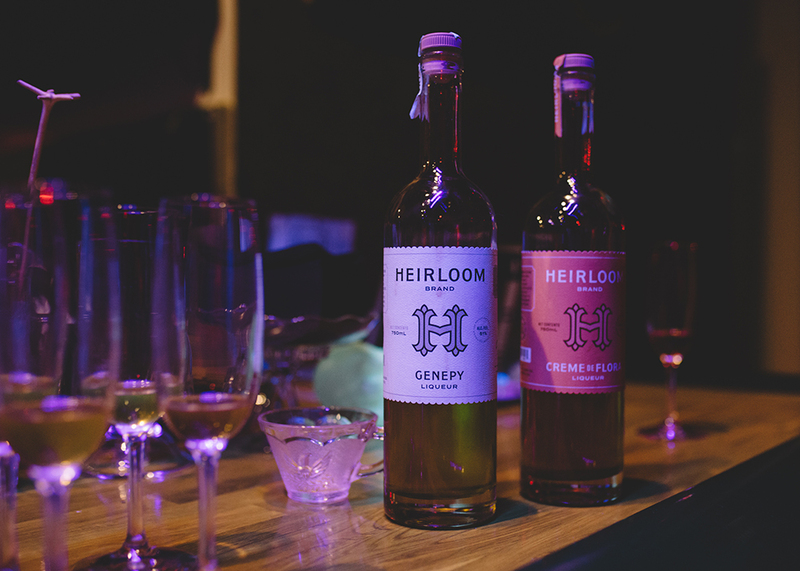 Heirloom, from Bittercube founders Nick Kosevich and Ira Koplowitz, partnering with their research and development coordinator Brandon Reyes, is a quartet of liqueurs built on a library of expressive botanicals (marigold, safflower, ginseng—among others). We caught up with Kosevich at Lawless Distilling, where the liqueurs are manufactured and get mixed into wild libations—Lawless’ current concept is the Vampire Bar, complete with blood-red goblets, blowtorches, and a menu themed around the seven deadly sins. 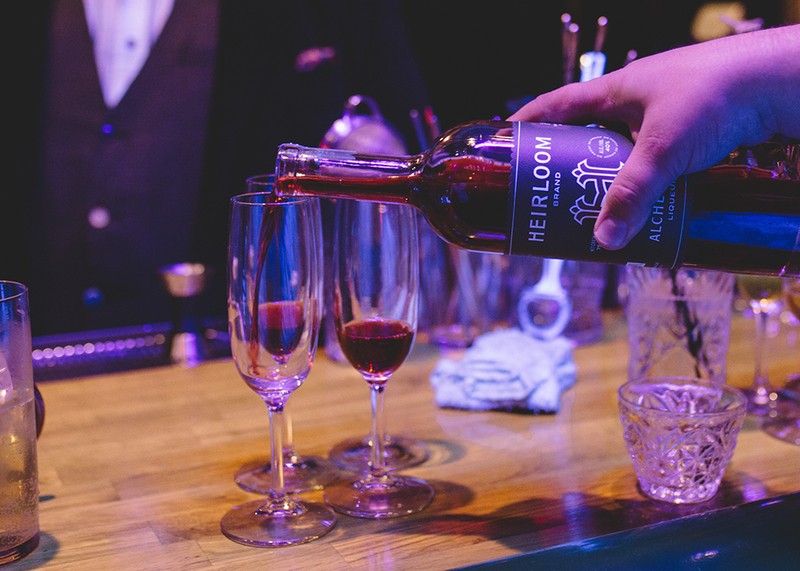 Any of these liqueurs can be made into a simple kir royale (½ ounce topped with sparkling wine), or in a highball (1½ ounces liqueur with 4½ ounces club soda). Here are some tasting notes and a few other ideas on how to mix them. Floral liqueurs are everywhere, from the violet in your Aviation to the elderberry in every brunch cocktail, ever. 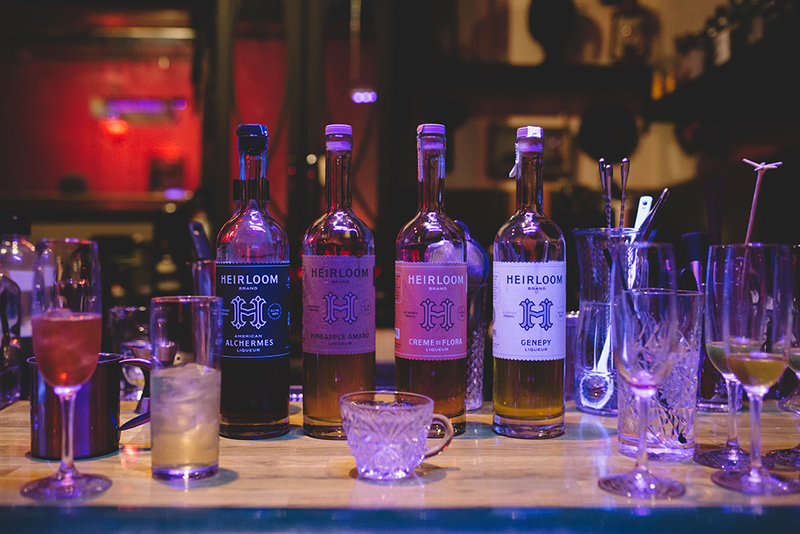 Heirloom’s take on the category leans on marigold, chamomile, lavender, jasmine, and rose petals. 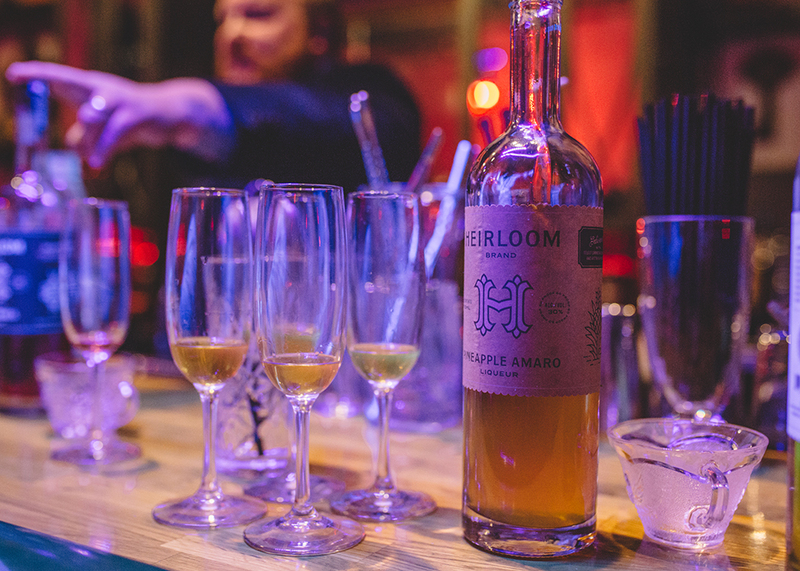 It has a little less sweetness than your average floral liqueur—there are bittering agents at play that balance the sugar and botanicals, resulting in a flavor like you’d expect from a bittersweet amaro. It begs for some citrusy new American gin—mix it into a collins or daisy. The only American-made version of this Swiss/French specialty, it’s definitely on the Chartreuse spectrum, herbal and perfumed by 26 botanicals including safflower and fennel. This one is spirit-strength, so hit it with tonic water for a brand new take on the G&T. A liqueur you never knew you needed, but once you taste it, you’ll be hard-pressed not to keep a bottle perpetually on your back bar. Victoria pineapples, ginseng, and other Caribbean botanicals combine into a bright and bittersweet tropical flavor. Kosevich calls it a “liquid story” of Brandon Reyes’ upbringing. 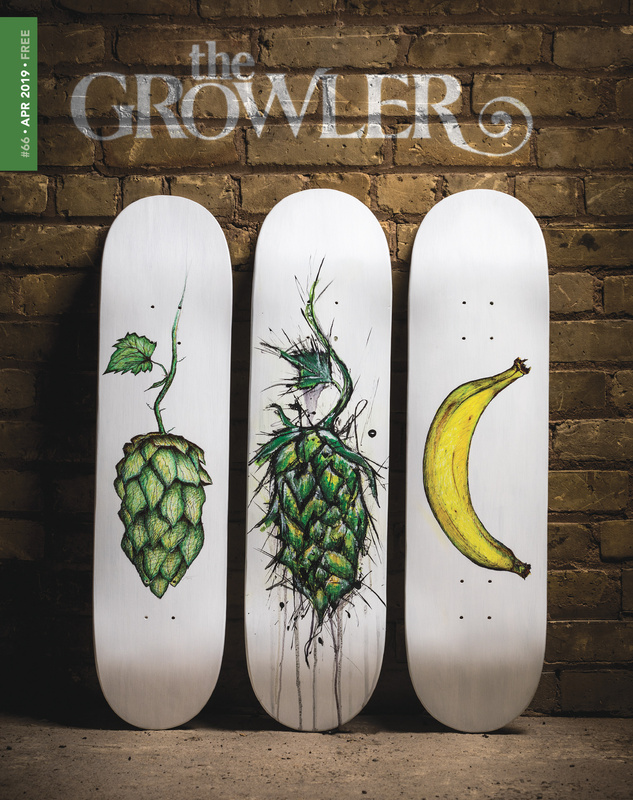 “His family is Puerto Rican, he grew up in Wisconsin, and this is an homage to those two places.” Add a shot of this to a lager and you’ll have something like an instant milkshake IPA. It’s also tremendous neat. Originally a 13th century potion thought to be an aphrodisiac, Reyes uncovered this liqueur deep in the pages of an old Italian science book. The red color comes from cochineal, the beetle that’s responsible for carmine dye. Don’t be fooled by the color, though: this is not Campari. Instead, it leads with a warm baking spice profile full of cardamom, coriander, and vanilla notes. Add some to your favorite bourbon drinks when the snow starts falling.